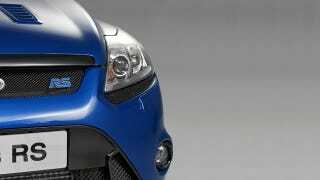 Some tea leave-readers were convinced that the next Focus RS was going to debut this week in Detroit. They were wrong. Now we're hearing Ford's turbocharged, all-wheel drive beastie is coming to the Geneva Motor Show, which makes way more sense. The RS has always been a Euro-only affair, so the land of chocolate and money laundering is a fitting setting for the hatch's coming out party. But unlike previous generations, Ford has confirmed this one will come stateside. The smart money is on a version of the 2.3-liter Ecoboost four currently fitted to the 2015 Mustang, but with 300+ HP being sent to all four wheels to compete with the Subaru WRX STI. Road & Track reports that it could be a system based on the Lincoln MKS' successor, but no technical details. In the meantime, here's a taste. Check for wheel slippage.